Hard cook eggs in your preferred method. Mine, for deviled eggs, is to steam them. That's just bringing water to a rolling boil, add room temperature eggs to a steaming basket and put them over the water. Reduce heat to maintain a nice boil and let steam about 15 min. Plunge them, basket and all, into a deep bowl of ice cold water and leave until cooled. Change water, if needed. Peel eggs and slice them in half, lengthwise. Carefully scoop out all the yolks into a medium bowl and place the empty whites on a large serving tray or egg plate. Break yolks up well with a fork or your fingers. Add mayo, mustard, relish, hot sauce and ground pepper and mix well until well combined and creamy. Adjust mayo as needed for desired consistency. With a spoon or piping bag, fill empty whites with the filling. Top with fresh snipped chives, if desired. In order for the stars to align properly you really shouldn't mess with your deviled egg recipe too much. This recipe is perfect. 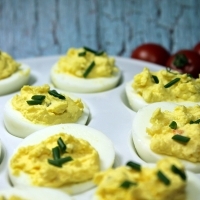 As much as I dislike mayo there is a place for it: Tuna salad, chicken salad, BLT's and deviled eggs and maybe a little on a slice of a good tomato, otherwise leave it in the fridge. I've experimented quite a bit with variations but yours is the quintessential recipe. My favorite so far is to add a Tbs of hummus and a couple cloves of fresh garlic per dozen. ...oh, and cayenne pepper is a must.